In Kundalini yoga, the mantra/meditation "Ajai Alai" is used to give you great strength to overcome any obstacle. It is supposed to lift you from depression and anger and is meant to be practiced whenever you need it. The lyrics, written in Gurmukhi (the most common script for writing Punjabi, a language spoken by about 60 million people in India). They are a little difficult for us westerners to pronounce but I will include the spelling as well as the meanings. 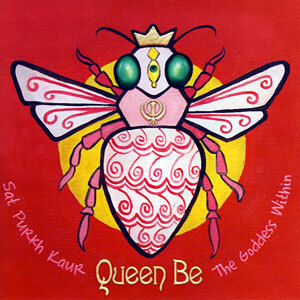 If you watch the attached Ajai Alai video below, by artist Sat Purkh Kaur Khalsa from her album Queen Be, you will hear the beauty of the words and also (like me) find yourself humming this beautiful and catchy tune whether you want to or not! Ajai Alai - Invincible, Indestructible. Abhai Abai - Fearless, Unchanging. Abhoo Ajoo - Unformed, Unborn. Aganj Abhanj - Unbreakable, Impenetrable. Alakkh Abhakkh - Unseen, Unaffected. Alaykh Abhaykh - Indescribable, Uncostumed. Anaam Akaam - Nameless, Desireless. Agaah Adhaah - Unfathomable, Incorruptible. Anaathay Pramaathay - Unmastered, Destroyer. Ajonee Amonee - Beyond birth, Beyond silence. Na Raagay Na Rangay - Beyond love, Beyond color. Na Roopay Na Raykhay - Beyond form, Beyond shape. Akarmang Abharmang - Beyond karma, Beyond doubt. Aganjay Alaykhay - Unconquerable, Indescribable.